1. The piece begins with a smooth, clay-coated wood panel, with 2" sides. These creamy boxes are lovely to look at and silky to touch. 2. 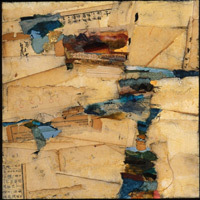 Then the top and sides are covered with paper from old Japanese books to create interesting angles, tones, and textures. In this process it's the imperfections, like wormholes and darkened edges, that attract me. The result is a "sculptural" base ready for the next step. 3. Now comes color and composition. 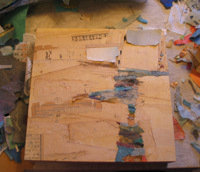 From my closet of papers, I tear tiny bits of color and texture and begin to experiment. One goal? 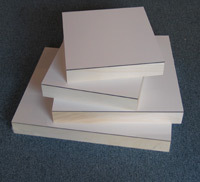 For papers to appear fluid again and to move over the contoured base like paint. 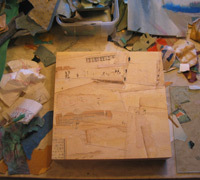 As each piece finds its place, a composition slowly emerges. 4. When the artwork feels complete (this could take days or weeks), various acrylic washes are added for warmth, and finally a coat or two of matte varnish.